Well that was just pants. 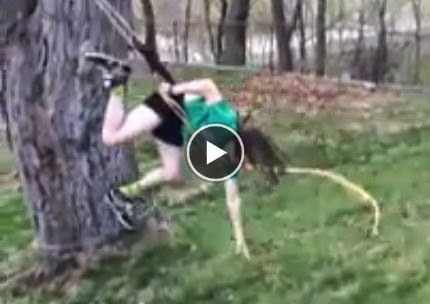 A #Pennsylvania student decided he would celebrate graduation by letting off some steam and going on a popular local rope swing. He even got a pal to film him. It all started off well and he roared in delight as he swung on a rope around the large tree. But then calamity struck. Somehow, his shorts got stuck in another rope hanging from a different branch and he was left screaming in agony as he gave himself a very large and very, very painful wedgie. The student, identified only as Tre Sev, was left shouting "This is not good." That, young man, is an understatement. "Swinging full speed on the Mansion rope swing in celebration of my recent graduation turns quickly into the most ridiculous moment of my year so far," he wrote on #YouTube.